How to know daily weather or weather tomorrow is good or not ? 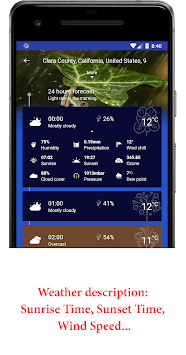 Now Weather is a beautiful & simple-to-use weather app will be the best tool to help you with this problem. - All the weather in Now weather, you see the current weather, the forecast for today and for several days ahead. - Display weather forecast clearly and easy to understand. - Weather radar to support for looking wind direction, humidity, and air pollution level. - Catch the beautiful moments of sunrise, sunset, full moon night with provided information. - Other useful information: actual temperature, humidity, visibility, dew point, air pressure, wind speed and direction. 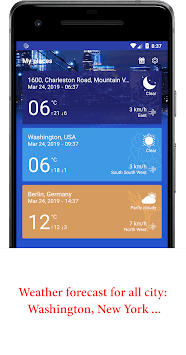 - Quick-view weather forecast using widget. 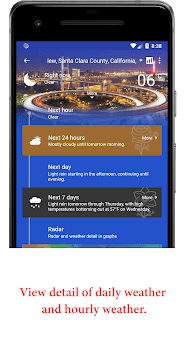 - Daily weather forecast notification. In the premium version of Weather Radar app with no advertisements. Please send email with us ASAP if you need support and share Now Weather to your friend if it helpful.